In the city of Triangulândia, the biggest dream of its population was to build a soccer field, but there all land is triangular. If one were to make a rectangular field, a good part of the land would be seized to build the field. 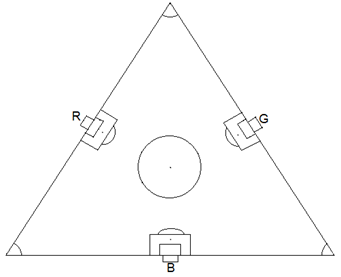 Then the Hypo and Tenusa brothers had a great idea: Creating a new game, derived from soccer, but played in a triangular field, and called the Tribol game. The rules were simple: They play three teams at the same time: Red, Green and Blue. • The match a time of thirty minutes. • The team that scores a goal in the opponent's the same counterclockwise, is a normal goal. • The team that scores a goal in the clockwise opponent the same, worth double. • If the two teams who make more goals have made the same amount, there is a tie, and the game is decided by penalties. • The team that makes the most goals, wins. Example of departure. The teams are arranged in the same field in the image below. • The team makes two goals in Red Green team, totaling four goals and winning the match . There will be several test cases . The first number being read C is an integer representing the number of test cases. Each test case begins with an integer P , representing the amount of goals in the match . The following will be read P lines , each with two characters M and S , indicating the first letter of the team that scored the goal and the first letter of the team that conceded the goal , respectively. For each test case output control of the game in normal time , based on the goals that have been marked .